I remember the first time I used the internet. The year was 1997 and I had been working for a company called Data Sciences for about 2 years prior to the IBM takeover. IBM came in and suddenly Windows was out the door and in came OS/2. Every employee was given a desktop computer and a brand new IBM Thinkpad. One of my colleagues who sat behind me suddenly announced that he had access to the internet. To be honest I didn’t really know much about it but looked over my shoulder to see what the fuss was about. With Netscape Navigator open my colleague asked me to think of a subject. As soon as somebody asks me to think of something my mind goes blank and a bit like Dan Ackroyd’s character, Ray Stantz, in Ghostbusters, it suddenly popped in there….. Billy The Kid. My colleague typed in the name of American’s most famous outlaw into the search engine (can’t remember which one it was) and sure enough a number of pages popped up providing pictures and information. Shortly after this experience I signed up for the internet at home for the first time. There were only a couple of providers available in the UK and they consisted of AOL and Compuserve. I signed up to AOL. There are a couple of things to note about AOL back in 1997. One was that it took a very bad internet explorer and added an extra layer of naffness to it. The other was that there was an instant messaging service called AOL Instant Messenger (AIM). Back then of course the top speed achievable at home was 56k and I remember that I started on a 33k modem. AOL Instant Messenger wasn’t the only chat service on the scene. Yahoo Messenger came along and it really was the Facebook of its time. 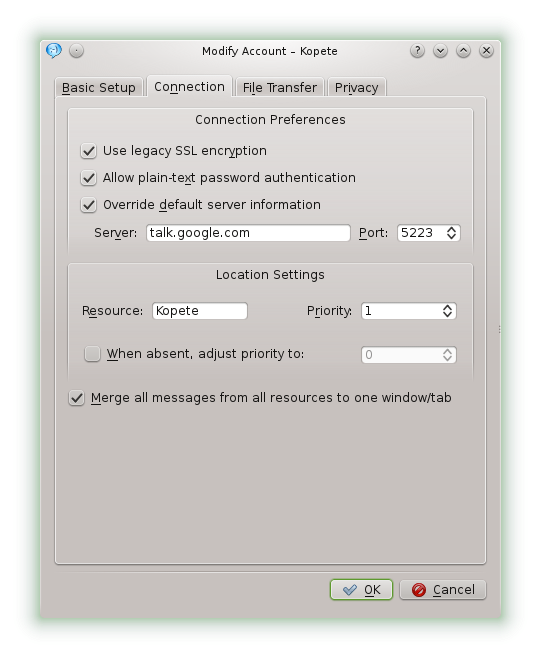 Other ways to chat included using ICQ and IRC chat. Nowadays of course the majority of people use services such as Facebook, Twitter and Google Hangouts to chat. AOL, Yahoo, ICQ, IRC and Windows still provide an instant chat service and that is what today’s topic is about. 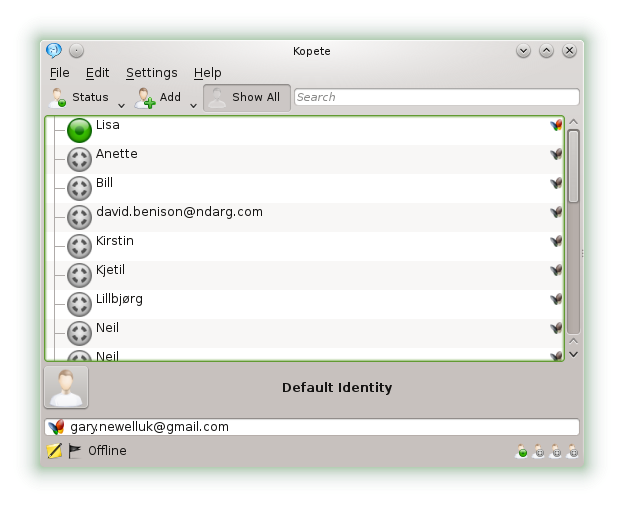 Kopete is a KDE based tool that can connect to AIM, ICQ, Yahoo, Google Talk and Windows Live. 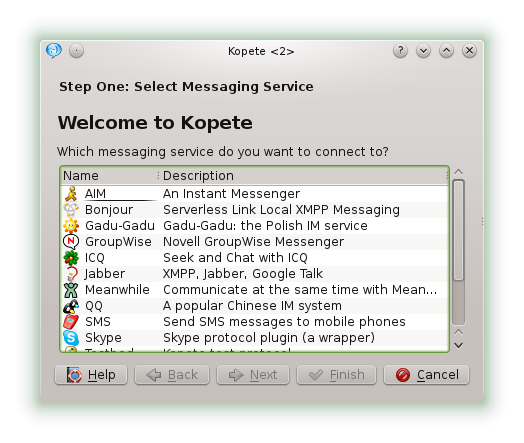 Using Kopete you an access a number of different messaging and chat services through a single interface. It has a very familiar look and feel to most other chat clients that have come out through the years including Windows Messenger. 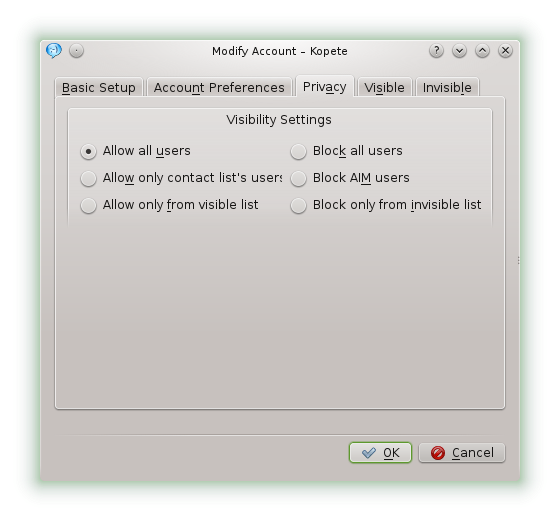 When you first start Kopete you will have a blank window because you haven’t added any accounts. To add an account press the “Click to add an account” link at the bottom of the window. A new window will appear allowing you to choose from a number of different services. Some of these I have heard of and some I haven’t. Which ever service you wish to use click on the name and click “Next”. Each service will have a slightly different account information screen. For AOL you have the basic setup, account preferences, privacy, visible and invisible tabs. To add your account enter your AOL screen name and if you want to automatically log in, click on “Remember Password” and enter your password. Notice that there is a “Register New Account” button for people without an account. When I clicked this button I was taken to a web page that clearly isn’t right. 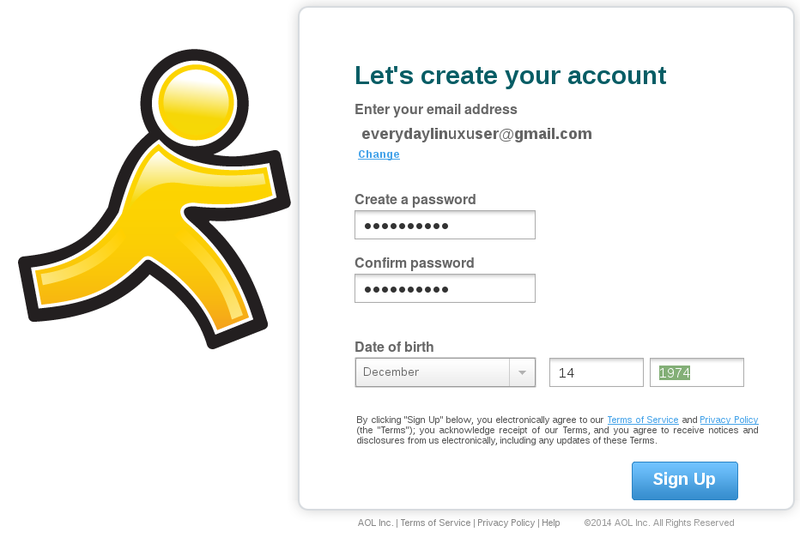 The AOL instant messenger service is alive and well however and you can sign up by visiting http://www.aim.com/. To sign up for a new account click on the “sign up” button. Simply enter an email address, password and your date of birth. An email will be sent to you to confirm that it is a real one. Click on the link to activate your AIM account. 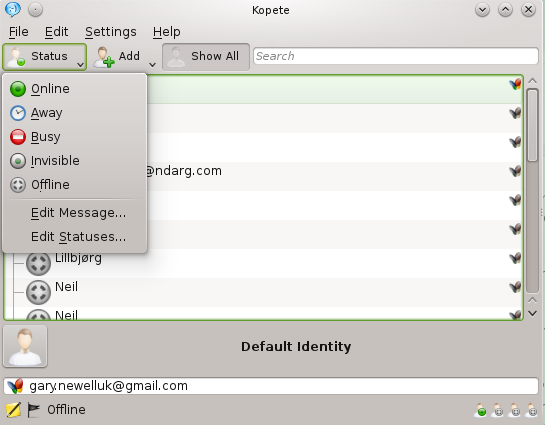 You can now enter your AIM email address and password into Kopete. The “Account Preferences” tab has server and port information. Unless you are having issues you can generally leave these settings as they are. The “Privacy” screen lets you determine who can see when you are online. “Allow all users” lets anybody see that you are online. “Block all users” prevents anyone from seeing that you are online. “Allow only contact list’s users” lets only your friends see that you are online. “Block AIM users” prevents AIM users from seeing that you are online. “Allow only from visible list” lets users specified in the visible list see that you are online. “Block only from invisible list” blocks the people in the invisible list from seeing you. The “Visible” and “Invisible” tabs allow you to add contacts to the relevant visible and invisible lists. This gives you full control over who can see when you are available. One reason I am not on Facebook is that I just don’t have time to spend chatting all the time and I found that when I was on Facebook (and before that Yahoo) that people would just start chatting 10 seconds after logging in. ICQ was very popular in the late 1990s and early 2000s. (but then again so were Webrings). Instead of having a name you are given a unique ICQ number to identify you. For some reason when I think of ICQ I am taken back to a day when people thought it was a good idea to have magenta backgrounds with yellow text and flowers on them, and menu systems were created within frames. 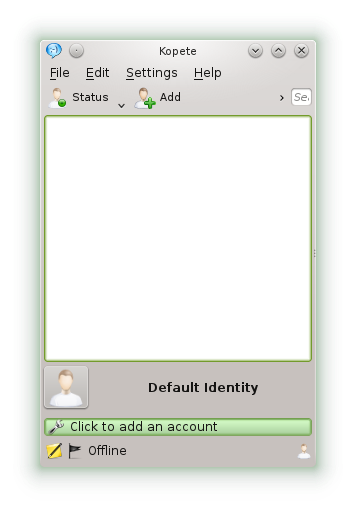 If you are still an avid ICQ user simply enter your ICQ number and password. 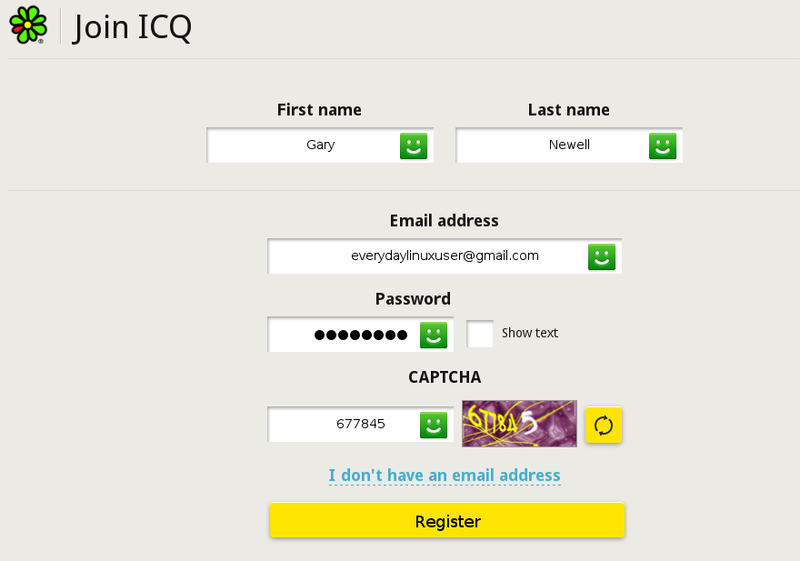 If you would like an ICQ number then click the “Register New Account” button. Now all you have to do is enter your name, email address and a potential password and the dreaded CAPTCHA. After signing up you will have an ICQ number. Use this number and password within Kopete. 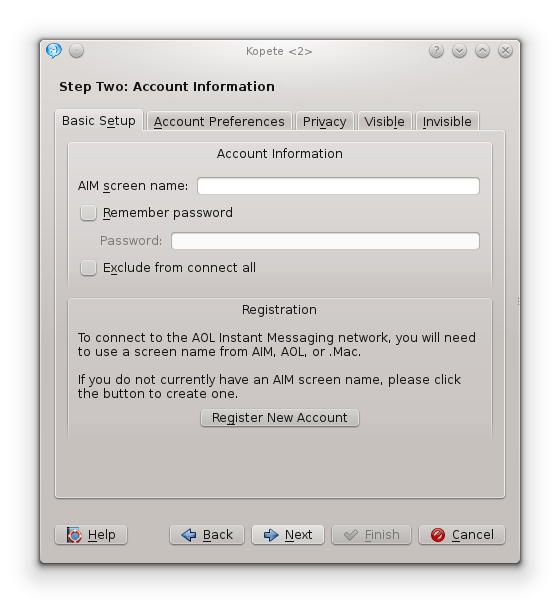 The account preferences and privacy tabs work in the same way as for AIM. 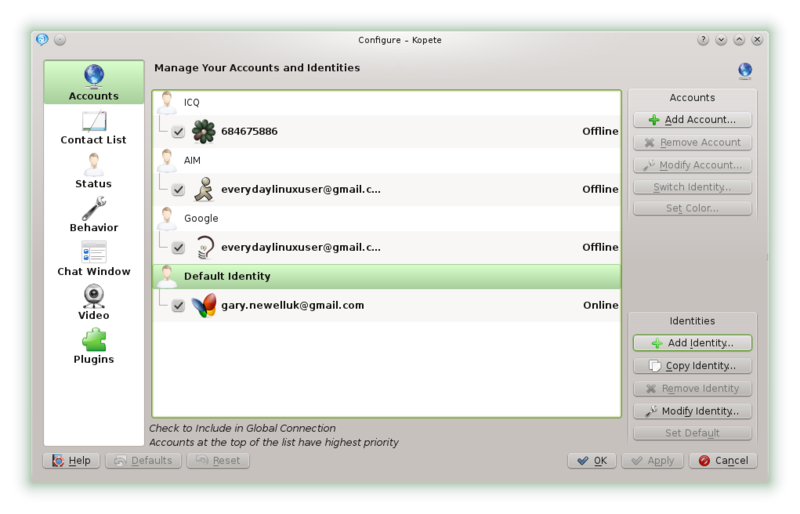 You might prefer to use Google hangouts but it is possible to chat using a Google account within Kopete. To create an account click “Settings -> configure” from the menu. From the manage accounts screen click “Add account”. The type of account to add is “Jabber”. Rather than use the option to register an account I would recommend going to Google and creating an account there. 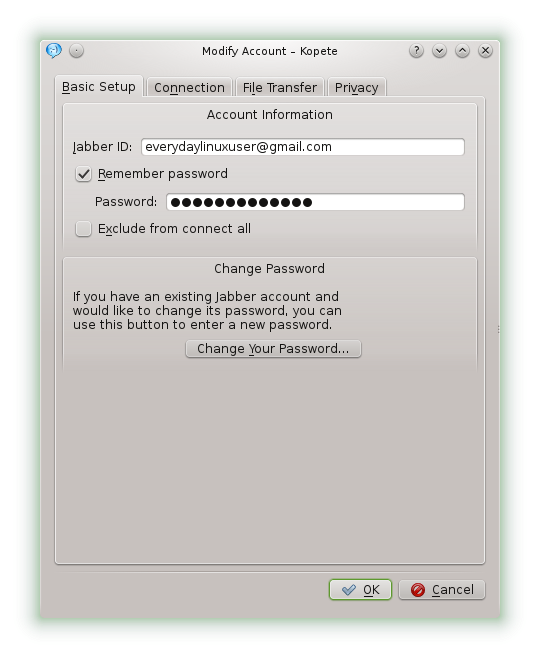 When you have an account enter the email address in the Jabber ID and click the remember password checkbox if you wish to log in automatically. Enter the password for your Google account. Check the “Use SSL encryption” and “Override default server information” boxes and enter “talk.google.com” into the server name box. The “file transfer” tab lets you enter proxy information if you aren’t connected directly to the internet. The “Privacy” tab enables you to determine how notifications are handled. 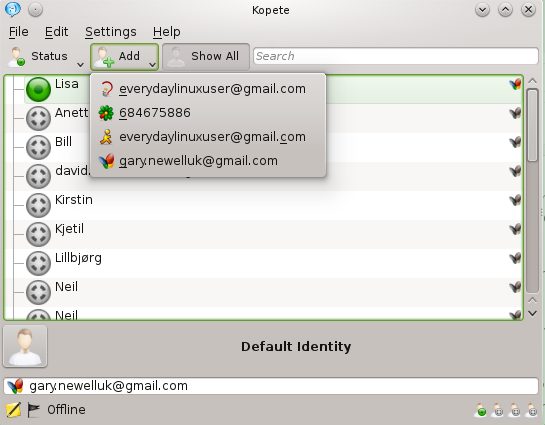 If you have a Windows live account then you can add it to Kopete. 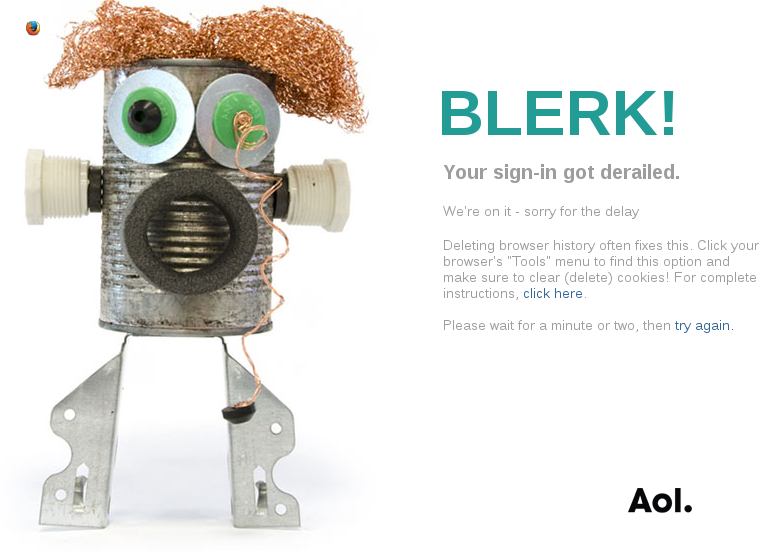 If you don’t have an account you will find that the “Register new account” takes you to an invalid page. To create a Windows Live account visit https://signup.live.com/signup.aspx. Enter your email address and password into the basic setup tab. The “privacy” tab lets you determine which of your contacts can chat with you online. The “connection” tab gives basic server information and unless you are having issues can be left alone. Finally the “General” tab lets you determine what happens with regards to the use of custom emoticons. I haven’t covered all the account types but you can generally work out the information required for each service quite easily. If you can’t register for an account using the “register new account” it is likely possible by visiting the website of the service itself. There is a Skype plugin but I would recommend using Skype itself. There is also an SMS account type. I tried to get this to work and I worked out quickly that you need to install SMSSEND via the YAST package manager. Being in the UK it is hard to find any HTTP to SMS services. Even when I did it was hard to get it to work with Kopete. I have managed to get SMSSEND to work but that is for another day. To manage your accounts click on “Settings -> Configure”. 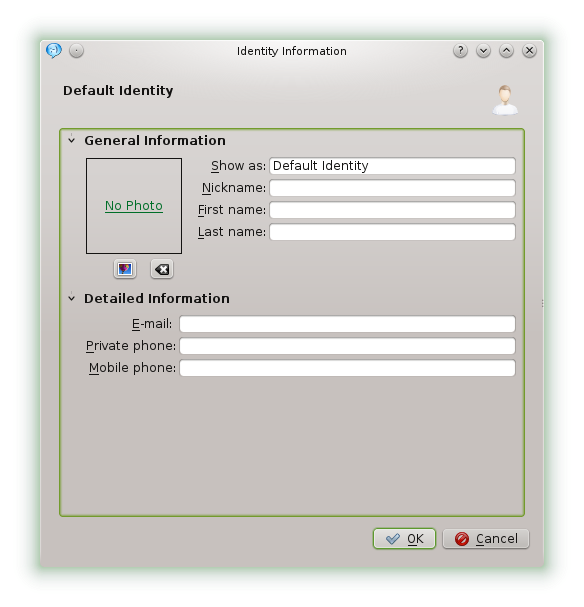 If you have added multiple accounts then you will see them all grouped together under “Default Identity”. Your identity is used to determine what people see when they look at your details. You can of course have just one identity for all your accounts. It is possible though that you want to have different nicknames on different services and use different email addresses. To add a new identity click the “Add identity” button. You can now create the details for the new identity by providing the information you wish to disclose such as name, nickname, email, phone numbers etc. To move an account to the new identity, click on the account and drag it over the new identity. 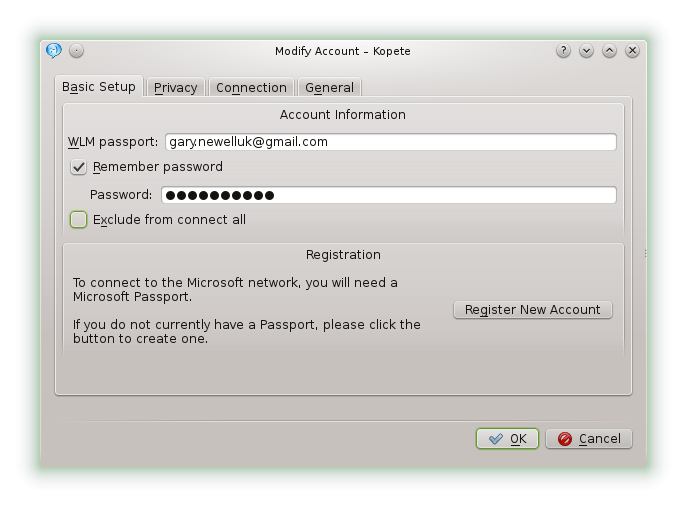 If you need to change details of an identity click on it and press the “Modify identity” button. If you want to add a new identity but with most of the details of another identity click on the identity you wish to copy and then select “copy identity”. You can now edit the details that need to be changed. 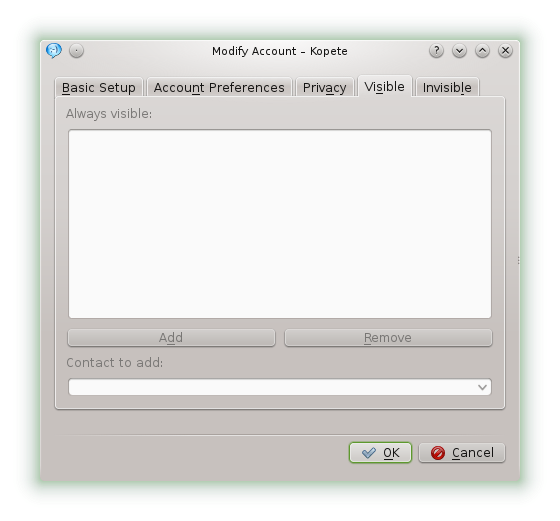 You will notice that the “Manage accounts screen” has a number of icons down the left side including accounts, contact list, status, behaviour, chat window, video and plugins. 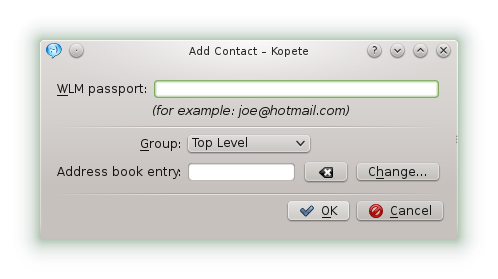 The contact list tab lets you determine how contacts are grouped, whether photos are displayed, set fonts and colours and determine the layout of the contact list window. The status option shows the list of available statuses. You can add and remove statuses and even group statuses. So instead of just saying “away” you can say “feeding the cat” or “eating my tea” etc. The behaviour option lets you set various behavioural settings (who knew?). You can set things like whether an icon appears in the system tray, determine how messages are handled and set your initial status. You can also set things like how long it is before you are set as being away. The chat option lets you choose the fonts, styles and layouts for the actual chat windows. The video option lets you configure your webcam for use within video chat. The plugins option lets you choose which plugins are used. 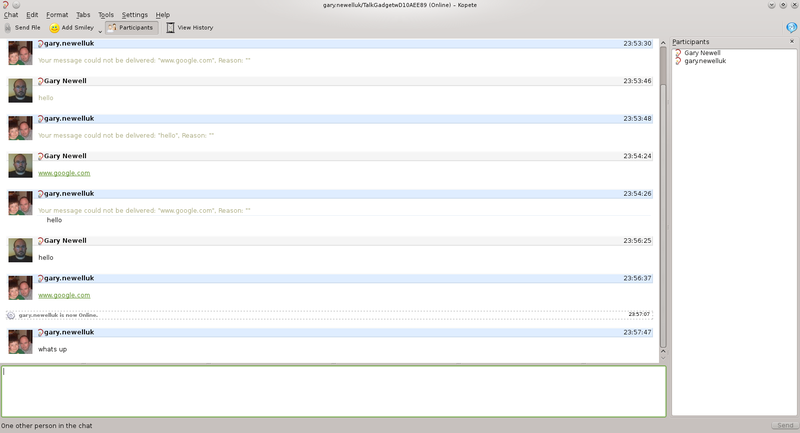 By default the history plugin is checked which logs all chats. There are also plugins for auto replacing text, bookmarks, highlighting messages and translation. The contact list will show your contacts from all your accounts. If somebody is online the icon next to their name will be green. To start chatting simply click on their name. If you right click on the name of a contact you will see more options such as the ability to send the contact a file, an email or a single message. You can also move the contact to a new group such as friends or co-workers. To add a new group click “File -> Create New Group”. Enter the name of the group and click “OK”. To add users to the group you can right click on their names and move them into the group or you can drag the contacts to the new group within the window. To add a new contact click the “Add” button and select the account to use. The window to the left is for Windows Live Messenger and simply lets you enter the Windows Live Accout Name. Note that you will start off looking at your default profile but you can switch profiles by clicking on the little dots in the bottom right corner. You can set the status of each account by clicking on the “Status” button on the toolbar. With regards to the identity you can change your avatar by clicking on the little image in the bottom left corner. You can use your webcam to take a picture for your avatar or you can click the “Add Avatar” button. As you can see I have turned myself into Britney. (Less said about that the better). To chat, just enter text into the bottom window and it appears on your friend’s screen. They type something back and it appears in your top window. Other things you can do is send a file, add emoticons and invite other people to join the chat session. There are some commands you can use as well that are useful. The most useful one to start with is /help as this shows you how the other commands work. Another useful command is /url. If your friend sends through a link you can use the /url command to open the url in your default browser. (You don’t even have to copy and paste it). 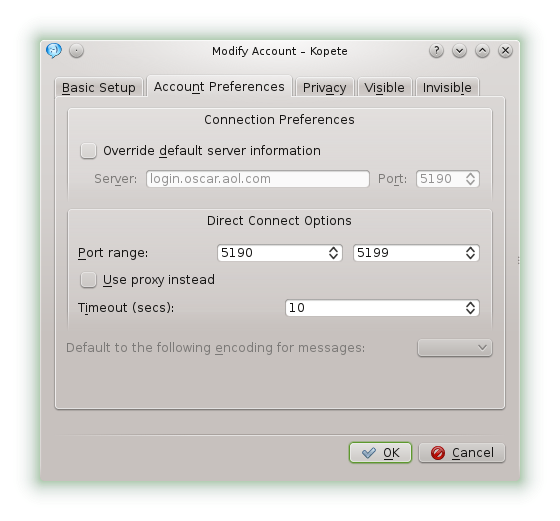 If you still use instant messengers then Kopete is a great alternative for AIM, Yahoo messenger, Windows Live messenger and many others. It isn’t complicated to set up most of the common account types and the chat interface is fairly intuitive. It feels like most other tools that do the same task. Hi Gary, what seems like AGES ago, I used to use Yahoo Messenger. I've had Windows Messenger (and possibly AIM before, too) but I've not used very many IM clients. I actually did have an ICQ account with a number many years ago; again, I did not use it all that often. By far the most common tool I use these days to do the equivalent thing, and it's far more ubiquitous (widely available) is phone text messaging, which does use SMS. You were asking about SMS – HTML tools; Mighty Text allows you to send and receive text messages between computer systems and SMS text messaging systems associated (at least here in the USA) typically with a mobile phone number. https://messenger.yahoo.com/ discusses Yahoo Messenger, which is really integrated into Yahoo Mail now; not even sure that Kopete works with it; I can confirm that in the past it most certainly did and it was what I used to use. Pidgin or whatever the GNOME IM agent is called these days, does the equivalent thing. Just sign into Yahoo Mail to enjoy the same Yahoo Messenger for the Web service you know and love. Yahoo Messenger within Yahoo Mail also allows you to chat with your Facebook and Windows Live friends without requiring any installation. So there you go, that ought to work. 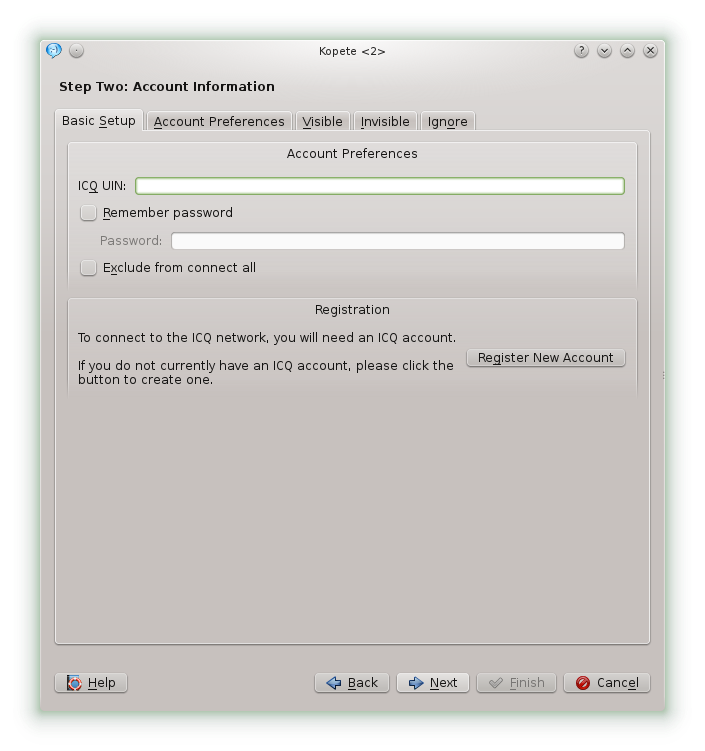 I tried to use Kopete in Mageia 4 KDE. There were some problems, for example it could start twice blocking the account records. Have a glimpse at the weblink about phone message monitoring application, you won't regret it.